City Sightseeing - explore it in your own way. Bagore Ki Haveli is an ancient building that stands on the platform of Gangori Ghat in the vicinity of Pichola Lake. The splendid architecture of the mansion boasts of delicate carved work and excellent glass work. In the eighteenth century, Bagore Ki Haveli was built by Amir Chand Badwa, who was the Chief Minister at the Mewar Royal Court in earlier times. When Amar Badwa died, the building came under the possession of Mewar State. In 1878, the Haveli made the abode to Maharana Shakti Singh of Bagore, who further incorporated three stories to the main structure. Since that time, the mansion came to be known as Bagore Ki Haveli (Mansion of Bagore). The mansion that used to serve the royalty of Mewar was left vacant for around 50 years. During this long period of desertion, the building deteriorated to an extent. In 1986, the building was handed over to the West Zone Cultural Centre (WZCC). The interiors of the Haveli are embellished with intricate and fine mirror work. While strolling in the Haveli, you can also see the private quarters of the royal ladies, their bath rooms, dressing rooms, bed rooms, living rooms, worship rooms and recreation rooms. In the evening, the haveli lightens and stages enjoyable performance of traditional dance and music of Rajasthan. The haveli looks marvelous with glowing lights in the night. Bagore Ki Haveli is a perfect place to explore the ancient architecture and life style of the royal family. 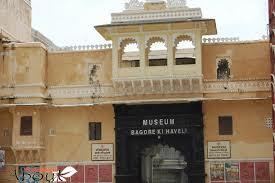 Bagore Ki Haveli can be reached by local bus, taxi or rickshaw as it is just 1.5 km from Udaipur city.